Every gallon of gasoline you burn releases 20 lbs of CO2 into the atmosphere. Want to help Plant Oregon in their effort to increase and secure future carbon sequestration?? 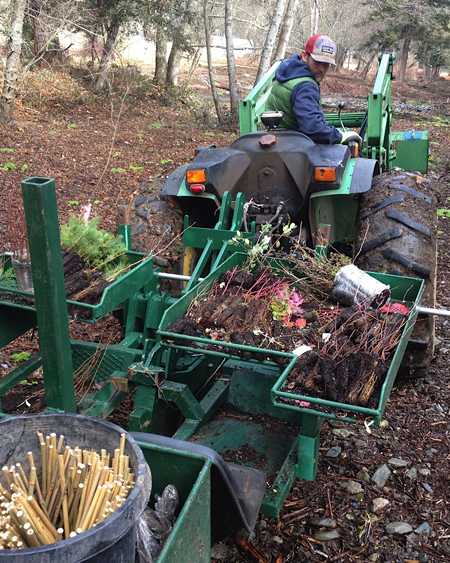 Plant Oregon is now offering Carbon Sequestration credits, at only $0.99 each, you can contribute to the planting of a native tree in one of their upcoming riparian restoration jobs in Southern Oregon! Buy one, or as many as you'd like, and rest well knowing you've done a little something to brighten the future for all of us. What better way to contribute to carbon sequestration than by spending a buck or two to help us plant more trees? What do trees have to do with it? As you may already know, trees (and all vegetation) take in CO2 and 'sequester' or take in the carbon molecules into their tissues, releasing oxygen as a by-product. This process removes the Carbon in gaseous CO2 from our atmosphere, and stores it as solidified Carbon, thus returning it back into the terrestrial part of the earth's carbon cycle and keeping the over-abundance of CO2 in our atmosphere in check. So, depending on growing conditions, one giant sequoia seedling can sequester approximately 3-5 pounds of CO2 per year- which means it can take one tree up to four years to sequester the CO2 we emit from burning one gallon of gas. Ouch! So...what do we do about it?! Our Carbon Sequestration Credit program is a perfect way to give a little extra and make a big difference. Make up to one tonne's difference by pitching in to help plant a tree that will sequester up to one tonne of carbon when fully grown! To learn more about how carbon sequestration is calculated, click here. and Here. To add Carbon Sequestration Credits to your quote request and contact our staff about purchasing some, click here.